The 161 Task Force will be hosting a community cleanup on Saturday, September 29th. We are calling all people in the immediate world, schools, religious groups, clubs and members of the public to join us as we better the community! The North YMCA will be hosting a FREE BREAKFAST for those who attend the cleanup. 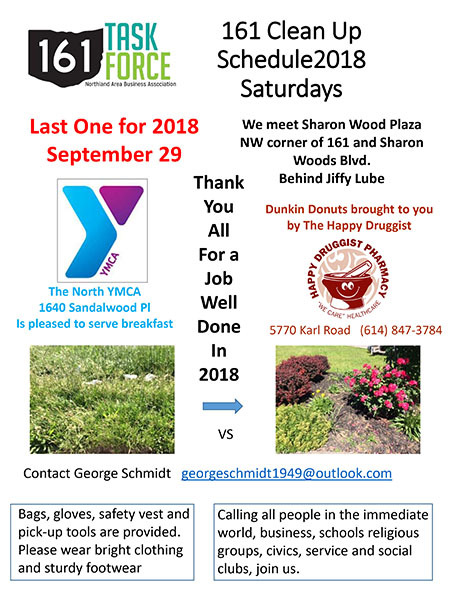 We will be meeting at the Sharon Wood Plaza located on the NW corner of 161 and Sharon Woods Blvd at 9:00 a.m. Bags, gloves, safety vests, and pickup tools will be provided. However, we ask that you please wear bright clothing and sturdy footwear. We look forward to seeing you all there!